A hotpot is quite tricky to cook in the van due to the massive temperature difference between the top and bottom of the oven. I use a pot with a lid to protect the potatoes from the higher heat, then whip the lid off for the last half hour. 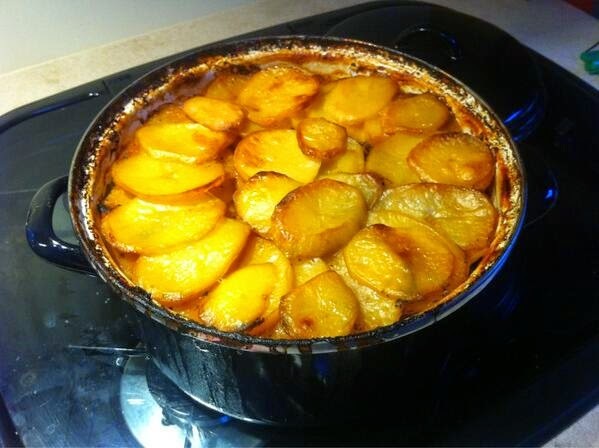 Please note I haven't dared call this Lancashire hotpot as it is nothing like the traditional recipe, it's just what I made up on the day. 1x Rosemary sprig, leaves finely chopped. 1. In a frying pan brown the lamb in a couple of batches. Put the lamb in the casserole dish. 2. Sweat off the onion and leek in the frying pan, add the garlic for the last minute then add to the casserole. 3. Fill the pan with about half a litre of water and bring to a simmer, add the stock cube, rosemary leaves and a good glug of Worcestershire sauce. 4. Thicken the gravy a little with cornflour (the cornflour must be mixed to a paste with cold water before pouring into the gravy). 5. Taste, season then pour into the casserole dish. 6. Add the carrots, swede, beans and celery to the casserole. 7. Pour in a glass of wine and give it all a good mix. 8. Layer the potato slices on the top, brush with a little melted butter or oil, season, put the lid on. 9. Put in the oven on gas mark 7 for about half an hour then turn down to gas mark 4 for about 2 hours. 10. Take the lid off and turn back up to gas 7. Its done when the spuds are nicely browned. 11. Put the pan on a trivet in the centre of the table and get stuck in.